Every Friday for many months to come will be reserved as “Flood Survivor Friday.” It will feature the cookbooks, recipes, kitchen items, dishes, gadgets, and anything else of interest that made it through the muddy waters of the seven-foot flood that literally washed away The Culinary Cellar on July 12. The first entry into this designated position is a miracle survivor just as its author. In the Culinary Cellar, I had an entire shelf filled with dozens of chef biographies and this was the only one that came through with only minor water damage. 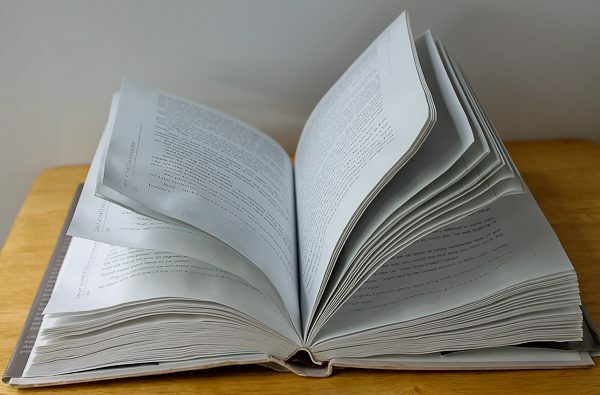 As you can see, some pages remain crinkly and stiff, and it probably won’t ever stand straight again, but that’s about it. 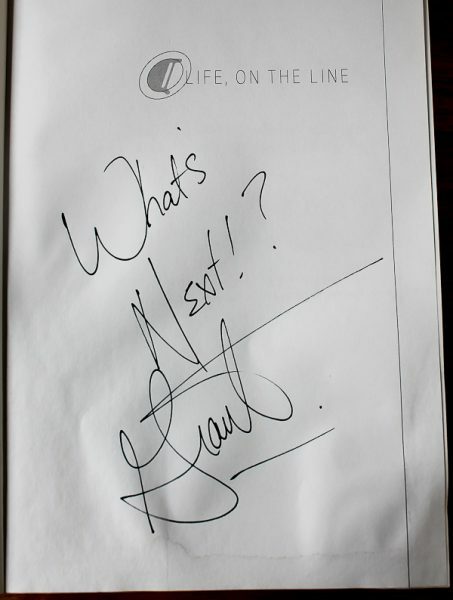 If you have read this incredible book or know anything about the author, Chef Grant Achatz, you know why it survived. The chef survived insurmountable odds to even be alive as did this book, but they are both here and thriving. In 2007, Achatz received a medical diagnosis devastating to anyone, but to a chef it was beyond a nightmare. He was given the tragic news that he had developed Stage IV tongue cancer. According to many doctors, he had no choice but to lose his entire tongue. Imagine getting such a choice for a chef. 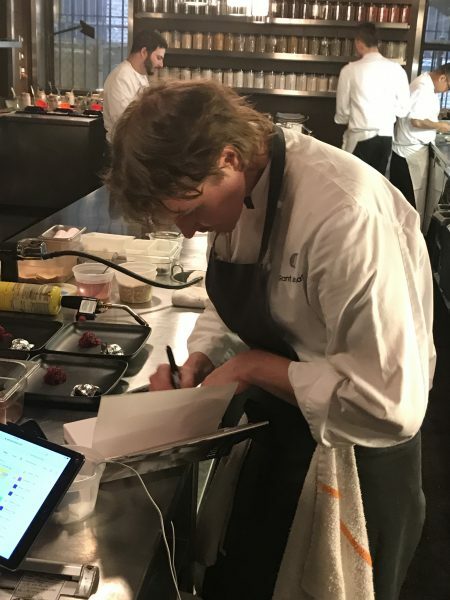 Achatz was not about to give up and found doctors at the University of Chicago willing to try aggressive treatment of chemotherapy and radiation and keeping the tongue intact. He was told, however, he would lose his sense of taste which may or may not return. 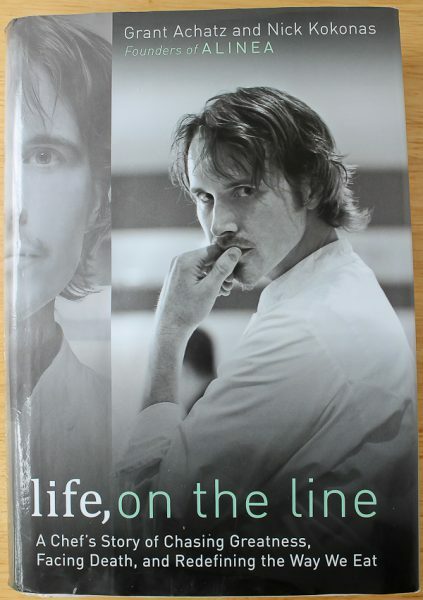 You will have to read the book for all the details, and I hope you do, but Achatz not only survived but flourished. His sense of taste gradually returned and he was declared cancer-free. If you are a fan of “Chef’s Table” on Netflix, watch his story on Season Two. 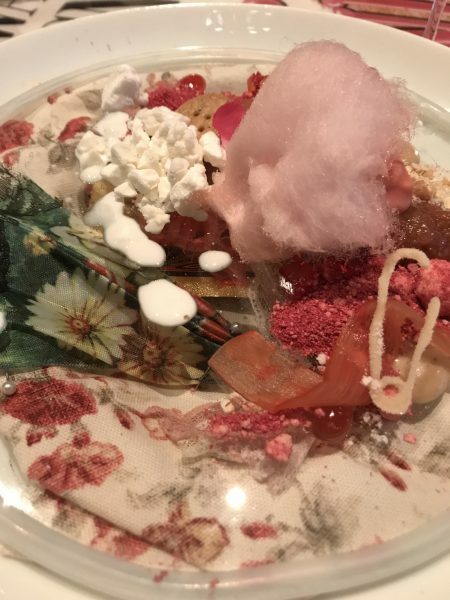 Achatz has achieved every accolade that most chefs could only dream of, including his restaurant in Chicago, Alinea, being named the Best in America by Gourmet magazine. At the time of writing this book with co-author Nick Kokonas, the two were in the process of developing another culinary masterpiece in Chicago, a fascinating restaurant called Next. Next happens to be my favorite restaurant and, oddly enough, actually has a story intermixed in the Culinary Cellar flood story. Next is not just an exquisite dining experience, it is an adventure. Its name makes perfect sense because the menu completely changes every three months, so one is always anticipating, What’s next at Next? But it is not just any menu, it is always a theme. For example, when my husband Bill and I went for my birthday dinner in April, the menu was “Ancient Rome.” Another time we enjoyed “The Hunt.” Kristina and I went to “Childhood,” which still remains our all-time favorite. To dine at Next, it is not possible to simply call and make reservations. One must buy tickets online, just like buying tickets for a Broadway play or sports event. At Next, it’s a crapshoot if you can get tickets. Once tickets are purchased they are non-refundable. This brings us to how this is intertwined with the flood story. 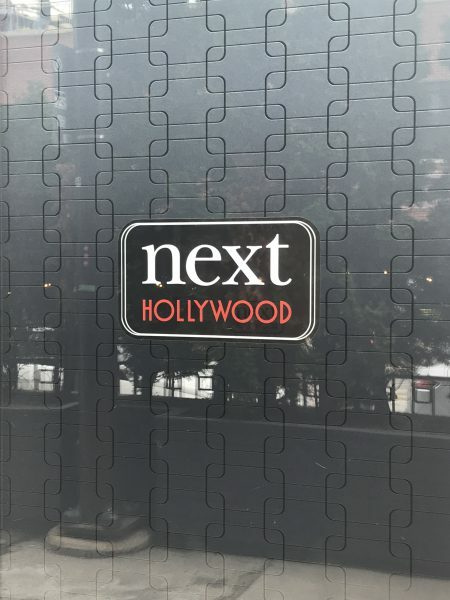 We had purchased four tickets more than a month before the flood for the newest offering at Next, which was Hollywood! We were so excited about this one. 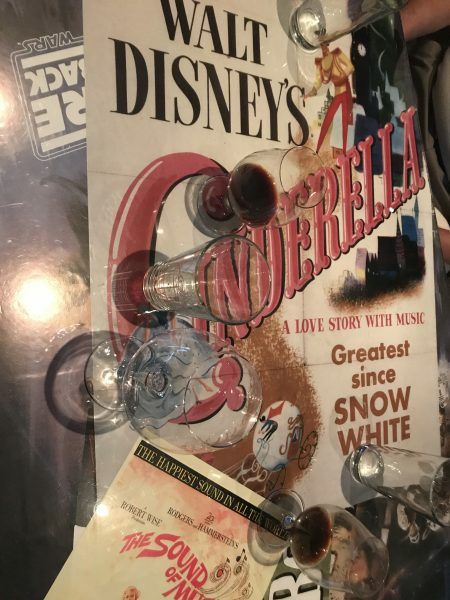 It was rumored that all the food would be inspired by famous movies, the music from the movies playing in the background, and a paparazzi would greet guests at the door on a red carpet and take a photo of your group. Our plan was to take our two cousins from Finland who would be visiting at this time. Since there were only four tickets and there were five of us because daughter Kristina would also be with us, either Bill or I would go but one of us would have to stay home. My darling husband insisted I be the one to go. Well.. then the flood waters came, one week before our Next reservations. They were all paid for, no refunds, and we were beyond exhausted from the flood clean-up process. But there was no way we were going to disappoint our Finnish cousins, plus we sorely needed a break so we decided to go. As I was getting ready, it hit me like a ton of bricks. I couldn’t go. Bill had to go. He worked so incredibly hard the past week with the clean-up plus he hadn’t spent much time with his cousins, so to me it was a done deal. It took lots of convincing on my part to get Bill out the door, but in the end he did. They left with one request from me. I asked Kristina to take my copy of Grant’s book to the restaurant, place it on the table and take a photo of it. I saw my book as a survivor, Grant was a survivor, so to me it made perfect sense. I wanted the two together. So off went Bill and Kristina with book in hand, meeting cousins Anna and Matti who were already in Chicago after a day of sight-seeing. The foursome met in front of the restaurant and had their photo taken by the “paparazzi.” Movie theme music like Lady Marmalade, Nine to Five, Bohemian Rhapsody, and many more played quietly inside. The list of movies or themes to be featured were waiting on their plates beside a rose twisted napkin. 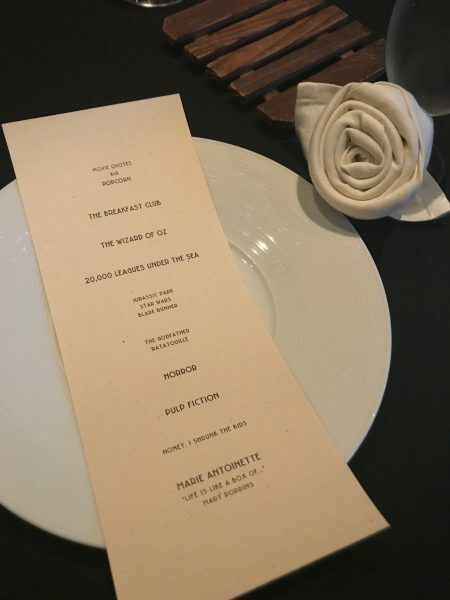 The menu offered 18 film references within 11 courses. 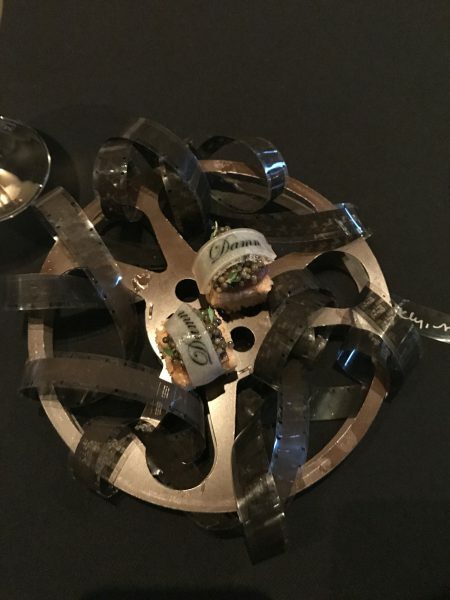 The first dish to arrive was a stunning movie reel covered in tangled film strips with one solitary bite: a cheddar biscuit topped with oestra caviar draped with a strip of gelee with the word “Damn” written on it, referring to, “Frankly my dear, I don’t give a damn,” from Gone with the Wind. Since no movie can be without popcorn, a big bowl arrived with a dust of anise seed and fennel pollen. 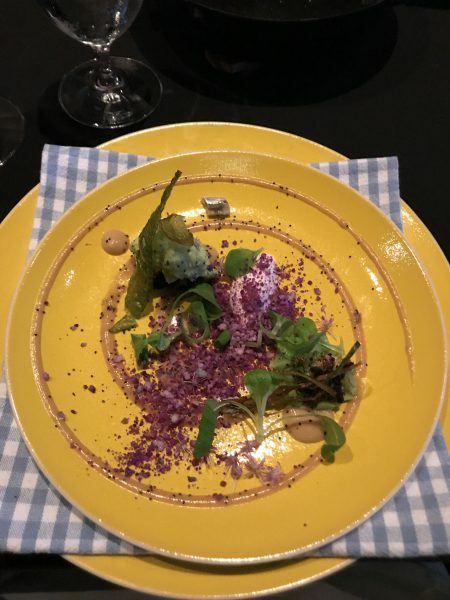 Two tiny cornhusk pieces rested on top, each bearing lengths of hollowed out baby corn stuffed with tarragon gel, wrapped in guanciale, dipped in Meyer lemon hollandaise and dusted with bottarga, tarragon, and celery. Sounds unbelievable, but Bill and Kristina said it was the best popcorn they had ever tasted. Ever. The Wizard of Oz yellow brick road plate sat upon a checkered cloth like Dorothy’s dress with an Emerald salad and strewn with poppy seeds. 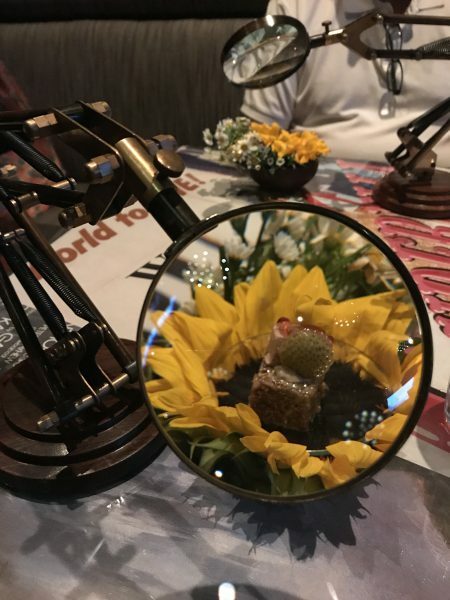 An adjustable magnifying glass turned foie gras, amaranth-sunflower granola, and green strawberry into a “Honey, I Shrunk the Kids” adventure. Somewhere in between dishes representing The Breakfast Club, 20,000 Leagues Under the Sea, Jurassic Park, Blade Runner, Star Wars, The Godfather, Pulp Fiction, Mary Poppins, and Ratatouille, the server whipped away a table top to reveal the one underneath, a collage of movie posters. 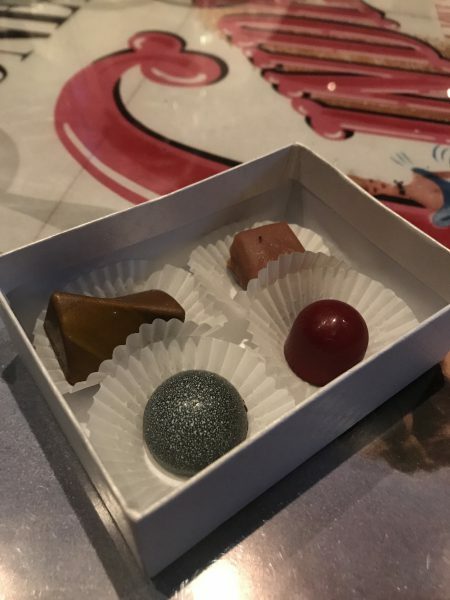 Of course, the best way to end an evening is with a box of chocolates, don’t you think? As the delightful evening was winding down, Kristina pulled out my Grant book to take a photo of it on the table as I had requested. The server noticed it and this led to Kristina explaining why she was taking the photo. Kristina said he was fascinated with the flood story and how the book survived. You know, he said, the chef is in the kitchen… Kristina asked if it would be possible to go take a peek at the chef working. He led them into the kitchen and there was Grant standing right near them. The server caught his eye and motioned him over. As the story was briefly told about the flood and his surviving book, he took the book from Kristina and signed it. Kristina sent me a text message at home with a video. She showed a shot of the book cover, opened it slowly, revealing what he wrote. I guess I don’t need to tell you I was in a puddle of tears. I can’t describe what it meant at this awful time to have something to keep me going. And I know What’s Next. A brand new Culinary Cellar. How fantastic ! What a great first book to start the Culinary Cellar again ! I couldn’t have wished for a better beginning book! What a blessing! And what a great beginning for ‘what’s next’ for you and the Culinary Cellar! Great read! Somethings are just meant to be. What a Beautiful story Debbie.!!!! My brother n law survived Stage VI tongue cancer last year too. It is a miracle he survived the treatment and now is cancer free. Love you too, old friend! It’s so good to hear your brother-in-law is now cancer free. So enjoyed reading this story. Chef Grant is remarkable chef and person to have such an imagination to come up with this incredible menu.. Glad your family got to go, only wish you could have been there as well. Glad you like it, Chris. I think he’s the most creative chef out there. It’s always such fun to see the new menus. What a fabulous tale to tell… Loved the read and am so pleased you are doing Survivor Friday. Thanks, Katherine. I’m looking forward to the new Friday blogs! Oh my! Brought tears to my eyes. What a wonderful story.